What size sail repair I can do myself? Usually 2" or smaller. For this size of damage you can use sail tape or dacron tape. *Before taping the damaged area, be sure to clean and dry the area being repaired. Salt, dirt, and sand will prevent the tape from sticking to the sail. We recommend if using sail tape or dacron tape front and back and round the corners. 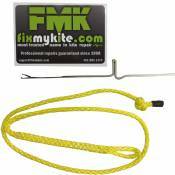 If the damage is greater than that you can either use Kitefix Fiber Fix or send your kite to fixmykite.com to be profressionally repaired. Does location of the sail damage matter? Yes, if the sail damage is close to a strut or the the leading edge, the sail tension is higher in that location. 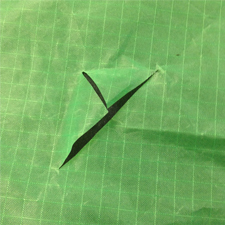 If the sail tension is higher, there is a greater chance of the sail damage to spread very quickly and should be repaired by a professional kite repair center like fixmykite.com. If the sail damage is not located in these areas and depending on the size you might be able to repair your kite yourself. If you have any questions on if you can repair your kite yourself, you can email pics to support@fixmykite.com. This is picture of two sail cuts really close to a strut. This cut will be fixed professionally. How do must sail damage Occur? Most sail damage occurs from the sail coming in contact from shells or debris on the groud. This mostly happens from someone launching your kite and dragging the sail on the ground. Another source of sail cuts is self launching on an area with objects that the sail can get cut on. So make sure when someone is lauching you they do not drag your kite to get in postion and make sure the area you are self launching in a safe area. How do I inspect the sail on my kite? 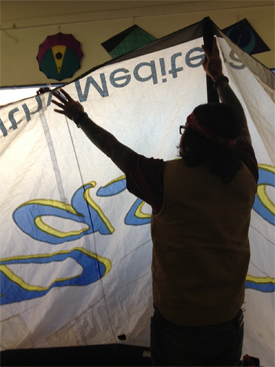 One of the easiest ways to inspect your kite sail is to hold up your sail in the light. Start with the leading edge, on the wingtip of the kite. Inspect the leading edge and sail along to the opposite wingtip. Repeat the process following the trailing edge. Some tears and pinholes can be difficult to find/see, so use multiple angles when inspecting your sail. If you have a cut, you will clearly see the light come through the kite. Another technique to check for sail cuts is to pump up your kite in a non windy area and check the entire sail area. Here's a Picture of Richard from fixmykite.com inspecting the sail. How can I prolong the life of my sail? The best way to prolong the life of your sail is not let you kite flag. This mean DO NOT leave you kite just sitting there on the land flapping in the wind. This movement of the sail will wear out and weaking your sail very quickly. As soon as you are done riding either pack up your kite or put sand on the trailing to prevent the sail from flagging in the wind. The worst flagging damage we have seen here at fixmykite.com was a customer had a brand new Cabrinha. After each time the customer would ride he would pump his kite in his back yard and dry it in the wind for hours. 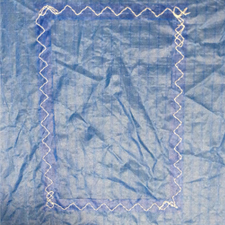 Within 2 months of this the material was so worn out that we could poke our finer the sail with ease. How does Fixmykite.com repair sails? Here at fixmykite.com we use two different techniques to repair sails. The first technique we use is doing a panel replacement. A panel replacement is when we have an exact color match of sail material and we replace the damaged area with a new panel that is slightly larger than the damaged area. Unfortunately, with all the different types of dyes used to color the ripstop this option may not always be something that can be done. The other technique we use is using sail tape. 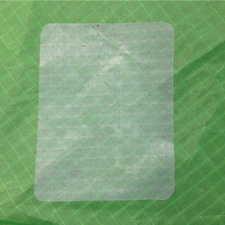 We use either clear sail tape (for all colors but black) or black sail tape. 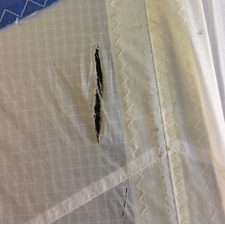 We usually use sail tape on severe sail damage like large panel blow-outs. 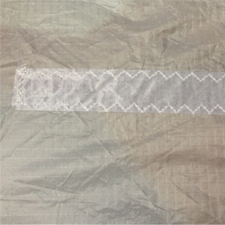 We put sail tape on both sides of the sail material and sew it. Now that area is twice as strong. That is why we guarantee our repairs.